Daffodils symbolize honesty and truth. They can also stand for forgiveness. They bloom each spring almost regardless of the winter weather. Daffodils should be given as a symbol of forgiveness, or in appreciation. 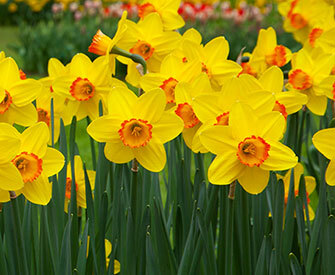 Even though they're not seen much in the US until spring, the Narcissus, also known as the Daffodil, Jonquil, or Paperwhite, is the flower of December. British custom places the more typically associated Poinsettia as the December flower. Well known both medicinally and botanically in ancient times, the exact origin of the name Narcissus remains yet unknown. It is often linked to a Greek term for intoxicated. Celebrated for many years in the arts, they are assocated with a wide range of themes in various cultures, including everything from death to good fortune, and are often treated as symbols of spring. There are some poisonous aspects to the Narcissus. Cases of poisoning or death have occurred when the bulbs have been mistaken as onions or leeks, and cooked and consumed. Despite their lethal potential, there's a practical use for them as well. They're grown commercially in Wales for galantamine - used in to combat Alzheimer's Disease. They're also some of the first blooms to appear in spring throughout the US and their appearance is associated with a number of spring festivals. These flowers have been symbolic of a hard won success, particularly in artistic endeavors. Giving an artist a bunch of amaryllis flowers is said to encourage both their creative muse and their achievements and strength in the arts. The September birth flower. This fall-blooming herb with daisy-like flowers stands for Wisdom, Faith, and Valor. Named after the Greek word for "Star" due to it's blooms reselmbing a star, Asters symbolize love, wisdom, faith, and color. The Aster flower blooms in pink, red, white, lilac and mauve. This flower became a symbol of love when in Greek mythology it was placed on the altars for the gods. So now, when you send a bouquet featuring this vibrant bloom, the message of "Take Care Of Yourself For Me" is implied. It conveys deep emotional love and affection for someone.This flower has also been known as Michaelmas Daisy, starwort and frost flowers and was at one time thought to of as a love charm. Although it was used in ancient times for medicinal purposes, they can cause dermatits in humans and upset stomach if ingested by pets. Take care of yourself for me. Fragile passion. In China, they represent womanhood and temperance. The English comes from the Greek term azaleas, meaning “dry." They are a member of the rhododendron family. Good luck. Native to Turkey, not Ireland as the name would suggest, Bells of Ireland are a symbol or wish of good luck to the recipient. However they are used in traditional weddings or special ceremonies in Ireland. Because of their shape they’re also known as Shell Flowers. The delicate camellia flower lends its feature to its symbolism: passion, perfection, desire, and polish. The also symbolize the longing to be with the beloved. Giving camellia flowers to your beloved is a good call. Fascination. Love. Distinction. In history, pink carnations are said to have appeared below the Virgin Mary's tears as Jesus carried the cross, establishing pink as a symbol of a mother's love. Leonardo da Vinci further solidified the connection with his 1475 painting "The Madonna with the Carnation." Carnations appear in different colors and each conveys a different meaning, much like roses. A pink carnation means affection, while a red carnation means ‘I love you.’ Striped carnations means regret that a love is not shared, while white carnations mean pure love, and yellow means rejection or disappointment. If you prefer edible flowers, you won't be disappointed or reject this bloom! They are a popular choice of cake decorators, and are used in the making of the French liquor Chartreuse. They're even used in ice cubes and to enhance the flavor of salads. I'll never forget you. A mother's undying love. Sweet & lovely. Innocence. Pure love. Good luck. Chrysanthemum or “mums" as they are more commonly known are one of the most widely cultivated flowers in the world. They serve as the birthday flower for those born in the month of November. First cultivated as a flowering herb in China in the 15th century BC, Chrysanthemums had blossomed - over 500 cultivars were in existence by the early 1600’s. They have much signifigance in Chinese, Japanese and East Asian history, even being adopted as part of an official seal of an emperor!Colonel John Stevens introduced the lovely bloom to the US in the 1700's and they've been widely popular ever since. Chicago and Salinas, California have adopted the mum as their official flower. In modern times, they are used to make teas for medicinal purposes - including benefits such as cooling the body, clearing the liver, supporting the immune system, reducing high blood pressure, relaxing the nervous system, lowering cholesterol, and even slowing aging. The secret meaning of the mum? "You’re A Wonderful Friend." What a sweet message you can send with such a beautiful bloom! Love. Good luck & best wishes. These spicy flowers can stand for varied meanings, including both warnings and change. A bit of a wild card, they are very useful for vibrant floral displays when paired with more slender flowers. Perhaps this flower could be warning of change, combining two meanings. Daises convey innocence, loyal love, and purity. It's also said to represent keeping a secret between friends. The daisy is a perky and fun bloom that comes in a wide range of colors and sizes. Daisies make up almost 10% of all flowering plants on Earth, growing on every continent except Antarctica. They spread their cheer on a global scale! Helping the bee population is one benefit of the daisy. Bees LOVE daisies! It has has interesting medical properties too. From slowing bleeding to relief of indigestion and easing a cough, they're beneficial for more than a beauty to the eyes. The garden daisy is known as the gardener's good friend for its ability to ease an aching back. Daisies have a long history and are found in a wide range of colors. It is actually an herb and symbolizes innocence, stability, sympathy and cheerfulness. Suitors would wear a Daisy during the days of knighthood, and the women would include a Daisy as part of their mementos to signify availability. A beautiful perenial that goes well from garden to vase, Delphinium have had a place in gardens since the 1500s. Reaching further back into ancient Greek history, blue hue varieties have been linked to stories of their color reflecting that of a dolphin. Overall, they do not have as pronounced of an impact on history as many other blooms. Like many other blooms that occur in a variety of hues, each color variation of delphinium conveys a different meaning. Pink means fickleness, white conveys a happy nature, and purple is often representing a first love. Overall, delphinium indicates strong bonds of love. They're pretty and fragrant, but don't let pets, cattle, or people ingest any part of the Delphinium plant. They're quite toxic to all of us - it can cause digestive discomfort if ingested, skin irritation, and possibly death. Perfect for the romantic at heart! Gardenias say “You're lovely" and are viewed as a symbol of secret love. They also signify joy and purity, and are associated with thoughts of beauty. Remembrance, faithfulness, and sincerity all are represented by the gladiolus. The remembrance aspect is seen as they are frequently used in sympathy arrangements and sympathy sprays. Their tall, strong stems symbolize a strength of character as well. Sometimes called a Sword Lily, the Gladiolus represents integrity and strength as well as calm, infatuation, and rememberance. The gladiolus also made a unique mark on history. In 1925, it was the word spelled correctly by Frank Neuhauser to win the 1st National Spelling Bee. The gladiolus flower, also know as the "sword lily," represents to many remembrance, calm, integrity, and infatuation. Gladiolus flowers indicate that the heart is being "pierced with love." I'm sorry. Please forgive me. Loveliness. I'll pray for you. The name is derived from the Greek terms “hydor" and “angos" meaning water and vessel. Loosely translated, this means they are a water vessel, in reference to their need for plenty of water to flourish. Often used to express a thank you for understanding and other deeper, heartfelt emotions. All colors of Iris represent eloquence. Different hues have different specific meanings too. Faith and hope both are expressed with the blue iris. Wisdom and my compliments are associated with the purple iris. Yellow iris can represent passion, while white represents purity. Lightness & swiftness, strong bonds of love. However, each color has a different meaning. Pink represents fickleness, white indicates a happy nature, and purple is representative of a first love. Toxic to humans and animals alike, it can cause severe digestive discomfort if ingested, and skin irritation. With over 300 species of flowers in the family, their name comes from ancient Greeks who thought the shape of the flower bud with its spur resembled that of a dolphin. This breathtaking bloom has two meanings, one as a sign of purity and magnificent beauty, and the other as a symbol of rebirth or resurrection. In ancient Greek mythology, the calla lily represented the goddess Hera. While in Roman history they were viewed to symbolize lust and sensuality, in more modern times they have come to represent virtue and purity, and are often associated with the Virgin Mary in Christian faith. Often used in both weddings and funerals, they are beautiful alone and require little additional flowers or greenery to create stunning bouquets for special events such as weddings. Innocence & purity. Sweetness. Majesty. Lily of the Valley means the return of happiness and is considered a sign of purity. Also known as May Bells or May Lilies, sweetly scented and delicate blooms make this flower particularly charming. This national flower of Finland as well as floral emblem of Yugoslavia has a global appeal. It even has a royal appear- it was featured in the bridal bouquet at the wedding of Prince William and Catherine Middleton. Look but don't touch! It's lovely blooms, leaves, and the whole plant are highly toxic. Lily of the Valley is native to woodlands in Asia, Europe, England, and Appalachia regions of the US, as well as found in some gardens. Before planting, remember to keep it in an area out of reach of pets. Known as "the herb of the sun", Marigolds symbolize passion and creativity. The common name in English, "marigold", is derived from "Mary's gold", as they were thought to be the flowers of Virgin Mary. It's brilliant color and scent led to some interesting views of this bloom. In the 15th century, superstitions caused people to suppose that it could remove ‘wicked humours’ from the head. In the following century, gardeners often presumed them to be poisonous. By the time of the Civil War, American doctors had found the plant offered antiseptic properties and packed open wounds with its leaves. Native to the Mediterranean, the Marigold has spread throught the world as a lovely garden plant. Two varieties are most commonplace now; the calendula and tagetes. The calendula has numerous medicinal uses! It is anti-inflammatory, antiseptic, antibacterial, and anti-fungal. You can find it used in lotions and ointments it is helpful for eczema, bug bites, and even sunburns. It is also used as a more frugal substitute for saffron in dishes. The tagetes variety is inedible and some are toxic, so before you drop a bloom in your dish, be sure it's a calendula variety! While various shades have special meanings, overall large magnolia blooms are symbols of perseverance, nobility, sweetness, dignity, beauty, and a love of nature. White magnolias also include perfection and purity, while pink ones are associated with youth, innocence, and joy. Kiss me! The earliest documentation of the custom of kissing under the mistletoe dates back to the 16th century. That’s a lot of kisses! Going further back into history and into European folklore, it was considered to be protection against poison, an aphrodisiac, and would bestow life and fertility. It can also represent affection or surmounting difficulties. Some variants are poisonous, so be cautious with this flower around small children and pets. Keep it high in the doorway, so you’ll have an excuse for another kiss! the pansy is unmistakable. The varying colors bring about an air of remembrance for those who moved on to the next journey after life. They are great for remembering, and also as a symbol of togetherness. Think of these the next time you see pansies. And remember someone who meant a lot to you. In short, pansies represent “thoughts." Happy marriage. The peony’s representation of bashfulness derives from the notion that nymphs were said to hide within its petals. In China and Japan they are viewed as the “King of Flowers" and are depicted frequently in paintings and artwork from the Eastern world. When given to a loved one, petunias send the message that “Your presence soothes me." With a name derived from the French term petunia, meaning tobacco, they are closely related to tobacco, tomato, and chili pepper plants. By any other name, they'd still smell so sweet... and be so adored! With so many varieties and colors, the meanings are seemingly endless. All colors have their meanings rooted in love and affection, with variations for each color. Red captures the essence of romance, while white speaks of innocence. Here's just a few colors and their meanings. According to fossil evidence, the rose is a whopping 35 million years old. During Roman times, they were used as confetti at celebrations, as perfume, or even for medicinal purposes. Moving into the 1600's they were in high demand - so much that they were treated as legal tender! In modern times, they've made their way into gardens, vase arrangements, and bridal bouquets, as well as into the hearts of many a romantic. Gracious. Fascinating. Protection from evil. Lasting beauty and a happy life are both represented by Stock. Bonds of affection and promptness are also associated with these lovely blooms. Happiness in marriage. Desire to travel. Tthe way a sunflower stands with its petals towards the sun should be an indicator of the symbolism of the sunflower. Spiritual attainment, along with good luck and ambition, can bring warmth to someone moving into a new place, starting a new job, or just because. Do you ever need a reason to send flowers? Have you ever watched a tulip bend its stem to reach the best possible source of light? Think of people who know who are always reaching for the next level, and we are not’t talking about video games. Aspirations in life drive some of us to do great things. Some of us are fungus, some of us are tulips. Irresistible love. Believe me. Declaration of love. Faithfulness. Modesty. Symbolizes a fragile or delicate love. Thinking of an absent friend or thoughts of a friend. Specific colors have different meanings too, such as magenta ones represent lasting affection, scarlet zinnias symbolize constancy, white blooms mean goodness, and yellow speak of daily remembrance of good memories.